IMPORTANT NOTE: It is always recommended to backup any and all important data before attempting to work on your computer. Even installing a new program can cause unforeseen problems that could result in a loss of your data. Backup Your Computer NOW! I am getting hundreds of junk emails? I think my Computer has a Virus? The time on my computer is always wrong? This is a very common problem and can be related to many issues or a combination of issues. I will discuss some of the most common problems that can cause a computer to run slowly. This section basically applies to computers running windows XP, however many of the suggestions here can also be used on Windows 98, 2000, ME, XP, Vista and Windows 7 with minor changes to the keystrokes or menus. Always BACK UP your computer before attempting any alterations to your computer. First, I am assuming that your computer was originally running well and is now starting to run slowly. If it never ran well or you just want to improve the performance then Check out Upgrading for Speed. NOTE: If your problem came on suddenly, setting your computer back to a day or two before the problem started using Windows System Restore may solve your problem. If your computer connects to the internet and is used for email, the first thing to check is for viruses. If you don't have antivirus software, shame on you... Go out and purchase or download one. Norton Antivirus or McAfee both work fine. Both Symantec and McAfee can scan your computer from their website if you want. Simply having antivirus software is not enough. It must be turned on and updated on a regular basis (weekly). New viruses are created every day and the only way that your computer knows how to deal with them is to update. So, now that you have antivirus software installed and updated, scan your computer for viruses. A full disk drive can slow your system down to a crawl. Double Click on My Computer and check to see how much Free space you have on your C Drive by Right Clicking on your C drive and select properties. Ideally, you want at least 15% Free. If you have less than 15%, you may need to do some house cleaning and delete some files, uninstall some programs that you don't use anymore or purchase a new larger hard drive. Just like your automobile, you need to perform routine maintenance to keep your computer in good running condition. Over time, your hard drive becomes cluttered with temporary files and portions of files scattered all over. At least once a month, you should clean and defrag your hard drive by first clicking on Start-Programs-Accessories-System Tools-Disk Cleanup. Then click on Start-Programs-Accessories-System Tools-Disk Defragmenter. (this can take several hours to complete). There are some great tools such as ATF Cleaner and CCleaner that you can download from www.download.com that will simplify the cleaning process. NOTE: You can schedule many of these maintenance routines to run automatically for you at selected times when you are not using your computer. Every time you go on the internet, information is being stored on your computer indicating where you have been and what you have been doing. All this information can build up and slow your system down. It is a good idea to purge some of this information every once and a while, depending on how much you use the internet. To do this, Start Internet Explorer and Chick on Tools-Internet Options and delete temporary internet files. You may also delete history if you want or reduce the number of days stored. Some people like to delete the cookies as well, but you may lose some stored passwords for websites and such. Some spyware can slow you down, especially while surfing the internet. Spyware are little programs that infect your system when you visit certain websites. They track your activity and report back to various websites. They are also responsible for those annoying pop-up ads. You can download free spyware tools to remove these problems. Malwarebytes, SuperAntispyware, Spybot and Adware are the most popular ones to use. You can download these for FREE from Download. com as well as other websites. In some cases you may have to run more than one of these tools to remove all of your problems. If you have a large number of programs and tasks running, it can slow you down. Check the bottom right on your task bar, if you have more than 4 or 5 icons, you may want to check to make sure you need all of them. You can see what is running by pressing CTRL ALT DEL and checking the applications and processes that are running. You can also click on Start-Run and type msconfig and check your startup list to see what is being loaded every time you start windows. Uncheck any items you don't want loaded during startup. You can always go back and recheck any items that you need. Be careful what you remove-you may need it. Uninstall programs and games that you no longer use. First check your programs menu and see if the program you want to delete has it's own uninstall program and use that. If not, go to START - CONTROL PANEL - ADD/REMOVE PROGRAMS and select the program you want to remove. If you are not sure about a specific program, leave it. The windows registry files can become cluttered over time and should be cleaned. Always back up the registry before attempting any changes to the registry. There are many programs available to clean the registry such as Norton System Works however many registry cleaners can do more harm than good. There comes a time, if all else fails, you just have to reinstall a clean copy of windows. Many avid computer users will do this once a year or two just to keep things running smoothly. Over time problems, errors, corruption and clutter start to compound and your computer comes to a grinding halt. With so many computers coming with DVD Burners, it is fairly easy to make restore images of your hard drive when it is running at it's best. As long as you keep backups of your data, you can restore your system back to working condition anytime it starts to give you problems. This will save you a lot of time not having to completely reinstall all software, programs and settings. It is never fast enough... You can buy a new computer or you could upgrade your existing machine. Unfortunately, upgrading can be a lot more expensive than a whole new computer. With the price of new computers falling, you can now get a new computer (the box only, no monitor), for as little as $450. The problem with upgrading is that the overall performance is based on the complete system working together and is only as fast as the weakest (or slowest) link. So if you upgrade the processor and you are still using an old, slow hard drive, you will not get the performance boost you expected. This hold true for most aspects of the complete computer system. I have seen many people spend $1000 or more upgrading their computer and still not achieve the performance of a new $500 computer. In order to get the most out of your upgrade, you must fully understand what components you currently have and what your needs really are. For example: If you routinely work with large files, especially opening and closing large files. You may benefit more by installing a new fast hard drive than upgrading your processor. Or if you are one of those people who has 10 programs open and you are working on several projects at the same time, then you may benefit more by installing additional memory than upgrading your hard drive or video card. In general, adding memory is the most common upgrade. But keep in mind that the amount of memory vs. performance is not a linear function. Going from 256meg to 512meg of ram will boost performance a lot more than going from 512 to 1024. Very few people find they need more than 512MB for Windows 98, 2000, XP or ME. For Windows Vista or Windows 7 you really need a minimum of 2GB. In most cases, more is better, but the return on investment diminishes quickly. As a general rule, check the memory requirements for the software that you are using. They usually have a minimum requirement listed as well as a recommended amount. If your computer has the recommended amount, you should be fine. If you are running at the minimum, then purchase some additional memory. I often like to go with double the recommended, but that's just me. If you are not sure as to the type of memory your computer needs, various web sites have a memory configurator that you can enter your make and model number and it will display your memory requirements. Visit pny.com, crucial.com, Viking or Kingston. If you have some specific needs, please feel free to contact us. Wireless networks have become one of our most popular requests. Families now have two or more computers( I have 8, but I am crazy). Anyway, I still recommend a wired network wherever possible. But sometimes you just can't run wires to other computers or in the case of a laptop, wireless is the only way to go. One thing to keep in mind with wireless is that all computers are sharing the same wireless bandwidth, so depending on how many wireless computers are on your network and the the way you use your computers, you could experience some slowdowns. This would be more noticeable when transferring large files between computers on the network then is would be with just general internet access. Many users complain about limited range with their wireless network and there is no one solution to this problem. Wireless range is dependent on a large number of factors. Some are controllable and other are not. Type of Construction - The construction of your house or office can effect the range of wireless transmission. Insulation, Wire Mesh, foil barriers, large appliances and the number of walls and floors between the transmitter and the receiving computer will all effect the range. Location of Wireless AP/Router - The location of the transmitter and receiving computer should have the clearest line of site possible. Transmitting through walls, floors, furniture and even people can reduce the overall performance. The best location for the transmitter (Wireless Router, Access Point) is generally above the receiving computer. In other words, placing the transmitter in the attic will usually give better results than placing it in the basement. Try to place the transmitter as close to the center of the house as possible. This will not only improve coverage throughout the house but also cut down stray signals leaving the house. If you want to go outside with your computer, you may want to move the AP/router nearer to that side of the house or attic. Looking at the diagram below, you can see how placement of your equipment can totally change how the signal must travel to get to your computer. Even slight changes in location can make a big difference. Try moving the transmitter (Router, Access Point) to different locations. I have seen situations where moving the transmitter 3 feet higher to a shelf made all the difference in the world. I can't stress enough the importance of trying different locations for the router or access point. Interference - Other wireless devices such as Cordless phones, intercoms, alarm systems, wireless speaker systems and wireless cameras in the house can all effect the range. Any device, such as a microwave oven, that uses the same frequency can be a major problem. If you are using a wireless B or G system and cordless phones that use the same 2.4 ghz band, this can destroy your range. You should either purchase a Wireless network that uses the 5 ghz band(802.11A) or replace your phones with either 900 mhz or 5.8 ghz models. Sometimes changing the channel on your wireless router or access point to channel 1 or 11 can help. If none of these are options, then try to keep conflicting devices as far away from each other as possible. Antennas and Boosters - Depending on the brand of wireless network you have, you may be able to purchase a high gain antenna or signal booster for it. The standard wireless router or access point comes with a standard omni-directional antenna that is designed to transmit evenly in all directions. There are many add-on antennas that can increase the range by focusing the transmission in a single direction. For example: If your wireless transmitter is located on one side of the house, it will send the signal in all directions including out of the house. If you purchase a directional antenna, you can focus the signal toward the inside of the house and away from the the neighbors, thus increasing the coverage inside the house. With highly directional antennas on both the router and the receiving computer, it is possible to extend the range up to several miles under ideal conditions. Multiple Access Points - Installing Multiple access points (or routers set to Access Point Mode) can greatly improve your wireless coverage. 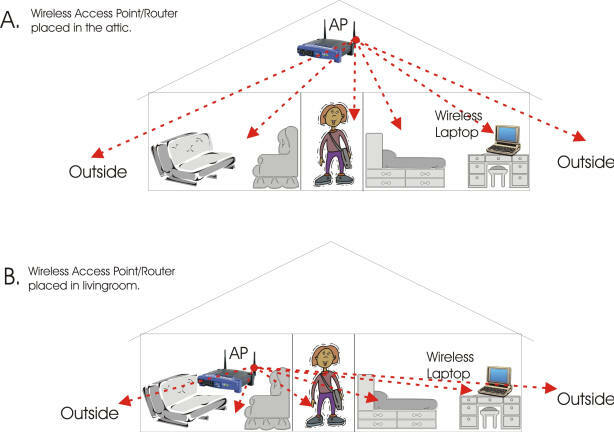 Many users with large or problematic homes will install two access points, one each on opposite ends of the attic, your wireless computers can then seek the best signal of the two. Repeaters - Another method of increasing the range of a wireless network is to install a repeater. You place the repeater half way between the transmitter and the receiving computer and it picks up the signal and retransmits on to the computer. Several companies sell repeaters, but keep in mind that most of these products will only work with same brand devices. Also note that using a repeater will reduce your wireless network speed and can be very problematic to set up and get working. For about $200 you can build your own repeater using a wireless bridge connected to an access point, but this takes a little know-how. Longer Range Wireless - I have found that one solution to range problems is to replace your 802.11b or g router with one of the newer N Routers. I have had excellent results with the both the Linksys and Belkin brands. I some cases you can expect 2 to 3 times the range if you use the matching Wireless N adapter card in your laptop. If your laptop does not have an N adapter the new router will not make much difference. Other Types of Networks - In some cases you just can't get a good wireless signal to reach a desired location and running a wire is not practical. In this case, you may want to use a power line bridge. You can bridge your network from one location to another utilizing the power lines in your home or office. You can purchase power line networking product from Netgear and Belkin as well as other manufacturers. There are also products out there that will send network signals through existing telephone lines. So regardless of your scenario, you can mix different networking technologies and should be able to resolve just about any networking problem. In general, depending on the installation, I have seen wireless ranges as poor as 20 feet to as good as 150 feet. I usually tell customers to expect about 35-50 feet through one wall or one floor. Pop-up ads are driving me crazy? This problem usually increases with time spent on the internet. You need to download and install a good spyware program. I recommend Malwarebytes, SuperAntispyware, SpyBot or Adware. They all can be downloaded for FREE from Download.com. Some Services like AOL and MSN now have self-contained protection for spam, pop-ups and Viruses, thus eliminating installing and updating all these additional programs. As with antivirus software, you have to continually update and run spyware tools to keep on top of this problem. Also, beware of installing some Free downloaded programs, many of these also install spyware and pop-up ads to pay for their free use. I have run into many problems with some of those free weather programs that place the current temperature down next to your clock. They can be cute, but watch out, they can really slow down your system. In some cases, you might want to try using a different internet browser. I have found that using some of the new alternate browsers with built-in pop-up protection like Firefox can greatly improve performance and reduce pop-ups. This is one of the biggest concerns for parents. There is so much garbage on the net. We don't know who our kids are talking to or what they are looking at. Many service providers like AOL and MSN have many controls to protect what kids are viewing and doing on the internet. You can use these services on top of your existing cable or DSL accounts. There are also many programs out there that allow you to set controls for children. You can limit online time, restrict viewing and stop chat rooms. You can even view a log of everything your child has seen or typed on the computer. One such program is called NetNanny and works very well. If you have a home network and are using a router. Many new routers have built-in controls that can restrict the hours that kids can access the internet as well as filter out undesirable web sites. This problem comes and goes. There are a number of programs available to block junk mail (spam). You can also set filters in Outlook and Outlook Express to move or delete email containing specific words. You can also set controls to block or accept mail only from specific people or addresses. Unfortunately, right after I told outlook to move all emails containing the word "Viagra" to my junk folder. The sender changed the spelling for "Viagra" to "Vaigra". One way that you can improve your odds is to create a second email for yourself. Use your main email address for personal use only (friends, family and work) and use the second address for all other internet activity like registering software, ordering products and requesting information. The most common questions I receive are regarding viruses and antivirus software. If your computer is connected to the internet and you use it to receive email, then at some point you will be subjected to virus attacks. Some viruses can be very destructive while many others only a minor nuisance. If you have a good antivirus software installed, updated weekly and turned on, you should not have to worry (that much). The antivirus software will identify the incoming virus and either delete or quarantine the suspect file. If you think you might be infected and don't have antivirus software, there are a couple of things you can do depending on the working state of your computer. 1. If your problem came on suddenly and you can catch it soon enough then the best course of action is to shutdown your computer and then restart it into safe mode. Then use Windows System Restore to set your computer back to a few days before the infection. Reboot and perform a full scan with Malwarebytes which you can get from www.download.com . 2. If you can still get on the internet, both the Symantec and McAfee websites can scan your computer for you for Free. Once you have identified and fixed the problem, you should purchase and install your own antivirus software to prevent future problems. If you can not get on the internet, then your only option is to go out and purchase antivirus software. NOTE: The longer your computer remains ON and infected the more damage the virus may cause. It is important to shut down and seek help as soon as possible. You would think that a $3000 computer would keep better time than a $10 Timex watch. NO, I have had some computers that lose or gain several minutes per day. Whether this is a real problem for you or just an annoyance that you can't stand, there is a solution. There are many FREE programs that will synchronize your clock with the NIST atomic clock whenever you want or you can set them to update your clock daily. I have used Atomic Clock Sync, you can download this free program from Download.com. In some rare cases, replacing your computers CMOS battery may fix the problem. Newer computers have the ability to update the clock automatically. Many customers ask me if they should build or buy their next computer? Well, the price of computers has dropped so much that you can get a low end computer for $500 now. To build a similar one from scratch could run you almost double that price. The biggest advantage to building your own computer, besides the experience and enjoyment, is that you get to configure it exactly the way you want. An other advantage is that you may be able to reuse some items from your old computer. And finally, having built it yourself, you may be more likely to be able to repair or upgrade it in the future. For example, without searching all over the internet for deals or reverting to eBay for components, here is a rough breakdown of a typical entry level computer built from scratch. Not this is a little old and based on Windows XP but you get the idea. *Note Motherboard contains onboard Video, Audio and Network ports. On paper, the specs here pretty much look the same as some computers advertised for $500. However, the component quality of this home built version is likely to much better. Usually, the lower end computers will use No-Name components, Lower cost Celeron or AMD processors and generic motherboards. In the example above, all the components are name brand and will usually result in a long lasting, trouble free system. If you wanted you could add or change any part of the system to match your needs, creating the ideal computer. You have probably noticed that I choose the Intel platform, it is not to say that Intel is better, but over the years I have built many computer systems and have found that I get the best results, especially in reliability and compatibility, with all Intel parts. If you don't mind a little tweaking and experimenting, there are a lot of other choices that may result in higher performance. But if you are looking for reliability and compatibility, I suggest Intel for your first build. If you are not real comfortable with starting from scratch, there are some companies that sell kit computers or something called bare bones systems. These systems may come pre-assembled with a case, power supply and motherboard. All you have to do is add the memory, processor and hard drive, saving you the hardest part of installing the motherboard. Special Purpose adapters - Depending on your needs, you may want additional cards such as Firewire, Extra USB ports, TV or Video Capture. Second Hard drive - Depending on you needs, you may want a second hard drive for backup, Music or video storage. Some form of CD drive to install software. This could be in the form of a CD or DVD burner or combo drive depending on your needs. Memory Card slots - If you use a digital camera, you may want to add card slots. Software - You will want some form of Antivirus software as well as some programs such as Office. Cables - Printer, scanner or any extensions you may need. Surge Suppressor or UPS to plug everything into. Never work while plugged in - Anytime you are working inside the computer, be sure to disconnect the power cord and all other connections to printers, network and external equipment. Static Electricity - You should wear an ESD wrist strap to prevent static electricity from damaging your components. Avoid working on or in a carpeted environment. Never place components or cards on the rug or other static generating surface. Reusing old Parts - If you plan to reuse some old parts from a previous computer, watch for compatibility issues. Even though an old hard drive may work, it may slow down the entire system. It will be unlikely that you will be able to reuse much more than your keyboard, mouse, display, floppy drive and maybe a CD drive. Avoid trying to reuse internal components such as Memory, processor, power supply and motherboard. Install one at a time - If you are building a high end computer with lots of upgrades and additional components, get it up and running with the basics first before installing the extras. Once you get the basic system up and running, start adding in the additional components, installing and testing one at a time. Powering up for the First Time - I can not stress enough the importance of double and triple checking all connections and cards before applying the power. I have seen many a motherboard destroyed because a memory card was not seated properly when the power was applied. Take your Time - I know you are anxious to get your computer up and running, but take your time and do it right the first time. Go ahead, build it yourself, enjoy, have fun and ask lots of questions. Those of you who are lucky enough to live in an area where you have both cable and DSL to choose from, have the difficult decision of choosing which service to subscribe to. I currently have both Cable and DSL service installed on my network and for me, I don't really have a preference, although DSL is less expensive. Here is what I have found. Please keep in mind the these services can vary depending on your exact location, so your own results may vary. Talk to your neighbors to find out which service they are using and how reliable it is. Overall, I have not found any compelling reason to use one over the other. Cable is much faster if you typically download a lot of large files or play online games. If you are just surfing the web and checking your email, you will not notice any difference between the two. If your area experiences interruptions to one type of service more than the other, you might want to base your decision on that. For example: If during heavy storms, you always lose your cable TV signal but your phone has never gone out, then you might want to choose the DSL option. Then you might need to create an all wired network or at least wire part of the network. The primary drawback to a wireless network is that all computers on the network are sharing the same bandwidth. For example: If you are backing up your living room computer to your basement computer and at the same time downloading a large file from the internet on your bedroom laptop, you could experience a real slowdown on a wireless network. But if your had the living room and basement computers on a wired network and the laptop on a wireless network, you would not see any difference in the performance on any of the computers. It would be impossible to discuss all the ins and outs of networking here, but the bottom line is: It is always best to run a wired network wherever possible and only use wireless only when absolutely necessary or where it is impracticable to run wires. If you plan out your network and make it a point to understand how you will be using it, you can have a very enjoyable experience with networking. There usually comes a time when you discover that you just deleted something by mistake. The first thing you should do is NOTHING! Well not exactly nothing, but my point is that the less you do on your computer after deleting files, the better your chances are that you will be able to recover those files. This includes digital cameras. If you find that you just deleted all or some of your photos on your digital camera, do not take any more photos. There are many file recovery programs out there. Keep in mind that even if one file restoration program did not find your files, another may. I had a customer the other day that lost all of his photos from a trip to Europe, I went through 6 different programs until I was able to recover his photos. Call us or check out the many programs available that can recover lost or deleted files. Please, Please, Please... I can't stress enough the importance of backing up your computer. At the very least, backup or make copies of your documents, photos and any other important information like quicken files. I can't begin to tell you how many times I get calls from customers who have lost everything. Years of documents, family photos and address books, gone in a flash. If you really don't want to do this yourself, there are many companies that specialize in online backup, where your data is stored on their computers for safekeeping. To backup your computer, you first need something to backup to. In the early days, a floppy disk was fine, but they do not hold enough data to be of any value today. A CD writer, DVD writer, second internal hard drive or external USB drive will all suffice. Check out my section on backup devices for more details. Depending on your backup needs, you may need some backup software. However, Windows does have a backup routine built in or you can just copy the files you want to one of the above devices. But if you want to automate the process by having your system backup at night or at specific times without your intervention, you will want to purchase a backup program. One important step is to scan your whole computer for viruses before backing up your files. You don't want to backup any viruses with your data. It is always a good idea to plan your backup needs before your start. Write a list of all the programs you normally use and take note of how large they are and where the files are saved. The size of the files will help you decide which type of backup device is best for you. Next you have to decide what data is important to you. The operating system and programs themselves can be reinstalled from the original disks, so they may not need to backed up. But, the things that you create like word documents, email and photos may be important and should be backed up. After you have decided as to what needs to be backed up and how large the files are, you have to determine how often you want to backup these files. Obviously, backing up every hour would be the best, but this may be just too much to do. So you must decide how much data you could afford to loose, one hours worth, one days worth or maybe a weeks worth of data. If you lost everything right now, what would you really want or need. With this information in hand, you set your backup schedule and stick to it. You never know when your hard drive will fail, a lightning bolt will hit or a virus will take everything. NOTE: For an easy, automatic, trouble free solution for backing up your computer, check out the many automated online services from companies such as www.carbonite.com and www.mozy.com . For as little as $54 per year you can sit back and rest assured that your data is safe. I highly recommend this to all my customers even if they are backup up already using other methods. Unfortunately, a computer is just like your automobile in that you have to perform routine maintenance. If you never change your oil, rotate your tires or bring your car in for service, it will eventually start giving you trouble. Although you computer does not have oil to change, there are several maintenance steps you should use to keep your computer running smoothly and reduce the number of day-to-day headaches. For step-by-step instructions, check out the maintenance section of this site. System stability can be a problem if you try to use older software on a new computer. I you upgrade to a new computer, you should update the software that you use everyday to the latest version. Trying to run software that was originally designed for Windows 95 or 98 on a new Windows XP computer will usually cause problems. It is not to say that you can't get them to run, but your chances of problems increase. If you are on the net, antivirus software is a must and if you have antivirus software, you have to update it weekly. New viruses are created every day and the only way that your Antivirus software can deal with these is to update the virus definitions as they come out. Most all antivirus programs will update themselves automatically, but you have to check the status window for your software every week to make sure it is working correctly. Occasionally, you may need to update them manually. Also, keep in mind that at some point you will have to purchase a new subscription to continue receiving updates. New computers usually are bundled with a 30-90 free subscription. After that you have to pay for continued coverage (usually about $20 per year). Windows has a built in disk cleaning utility that should be run at least once a month if not every week. From the Start Menu, select Programs, Accessories, System Tools, Disk Clean Up. Depending on how much you use your computer and how often you install and delete programs and files, data on your hard drive becomes fragmented. What this means is that files are broken up into small pieces and spread all over your hard drive. When your computer needs to retrieve a file it has to work extra hard to find all the information, thus reducing your performance. Running Disk Defragmenter will reassemble all of these broken pieces into contiguous files speeding up disk access. From the Start Menu, select Programs, Accessories, System Tools, Disk Defragmenter. Note: depending on the size of your hard drive this procedure may take several hours. Installing a surge suppressor is a worthwhile investment and purchasing a UPS (uninterruptible power supply) is even better. For as little as $30 you can purchase a UPS power strip that contains surge suppression as well as a battery backup that will keep you computer running in the event of a brief power outage. Microsoft continuously makes changes and patches to Windows to fix various bugs and security holes in their software. It is important to download and install these updates to keep your computer running smoothly. In Windows XP: Right Click on My Computer-Select Properties-Select the Automatic Updates Tab-Select the way that you want your updates installed. If you have a broadband internet connection you can select any of the options. If you have a slower dialup connection you may want to scheduled updates to take place late at night when you are not using your computer. I know that this seems like a lot of work, but you can set windows scheduler to perform most of these in the middle of the night. For those of you who don't leave your computer on at night. Pick one night per week to leave your computer on and schedule all the tacks for that night. If you are like me and have a few key programs that you use all the time, you have probable thought about upgrading to the latest version to get all the newest features. Well, I can't express enough the importance of doing a little research first, especially if you have a slightly older computer. In order to get all those new features you want so badly, you will usually sacrifice something and it usually means speed. I just upgraded a program on my faithful laptop and the program is now unusable to me. Granted, my laptop is an older 400mhz model with only 256 meg of memory, but it has worked fine for every application I currently use or need on a laptop. I did upgrade the hard drive and installed Windows XP for reliability reasons, but it has worked well for many years. I use a contact manager (I will not mention the brand) to organize my appointments, check email and store all my customer information. I use it all the time and is probably the most important and useful software I own. When a customer calls, I can enter their name and wallaa... all their information is on the screen. I have access to what type of computer they have, when I last worked on their system, the type of problems they have had in the past and just about any other information I need to know. I figured that since I use this program all the time, it would be well worth the cost to upgrade to the latest version... Right, it makes perfect sense? It must have some new features that would make it even more useful to me. Well that was my first mistake. I assumed that since I had a version that was a few year old, the new one must be better, faster and easier to use. WRONG!!! I happily paid the $229 for the latest version and installed the update. I was so excited in anticipation of what new features I would discover and how much time I could save with this new program. Well I have to tell you, I should have just given that $229 to the first person I ran into on the street. The new version is virtually unusable to me now. It takes over 3 minutes to start the program, over an hour to backup my data and by the time my customers information comes up on the screen my cell phones battery is just about dead. My first thought was that I must have had a problem during the installation or some settings on my computer must need to be changed. I called technical support expecting to discover an easy resolution to my problem and there was none. The company had changed the database engine and needs more memory and a faster computer then the earlier versions. Even though my computer meets the minimum computer requirement stated on the package, it is too slow to be useful. Most retail boxes or software Websites state the minimum system requirements as well as recommended system requirements to run their software. Minimum requirements means the program should run, but that's about it. If you want the program to run well make sure you have a computer that meets the recommended requirements. Go to the companies website and check in the support section for known problems with the software. If they have a forum, check there too. You may find some complaints here but many companies remove the really bad ones or don't allow you access until you become a registered user. There are many forums out there that you can check for other people that are having problems with a particular software. You can even just go to google or yahoo and type in "problems with xyz software". Unfortunately, I did not check the internet until after I purchased and installed the software. I see now that everyone is complaining about the same problem that I am having. Backup all your data before you upgrade any software. You may find that you need to go back to the original version. Slow Start – Digital cameras take longer to turn on to get ready to take the first picture. This can be a problem when you see something to shot and that special moment has past before you can turn it on. Shutter Lag Time – Digital cameras generally take longer to actually snap the picture when you first press the shutter button, often causing you to loose that split second perfect photo. Newer cameras a getting faster but it still can be a problem for some people. Especially if you take a lot of action shots. Slow Shutter Speed/Low Film Speed – Consumer graded digital cameras just don’t seem to do as well as film cameras on action or moving subjects. You also have to hold the camera very still for a good clear photo, especially when zooming. This can cause blurry photos on sports shots. You may not be able to get the same kind of photo that you can get with a good SLR camera with high speed film. Time Between Shots – Most of the low to mid range digital cameras require several seconds to save your photo to the memory card before you can take the next picture. The higher end cameras have a burst mode that may allow you to take several quick shots before having to save the images. If you take fast, consecutive photos, this could be a problem. Poor Battery Life – Digital cameras can really consume batteries. Newer digital cameras are getting better at this, but can still be a problem for some users. Note: If you purchase a digital camera that uses a rechargeable battery, you will want to pick up a spare battery. All your Eggs in One Basket – Digital cameras store their images on memory cards opposed to film. You can purchase different size cards that will allow you to store anywhere from just a few photos to well over a thousand. I have had customers that on occasion have had a defective memory card and lost all of their photos. The entire trip was gone in a flash. The dilemma that you face is do you use a single large memory card or several smaller cards. With a single large card you face the possibility of losing everything where as with several smaller cards, if something goes wrong, you lose a smaller number of pictures. What do you do with all the Photos – Most people find that they take far more pictures with a digital camera then they ever did with a regular film camera. The problem you face is where and how do you save all of those photos. I have seen too many people simply downloading their photos to their computers hard drive and thinking they are safe. Then 2-5 years down the road something goes wrong with their computer and they lose everything. Years of photos down the drain. You need to set a plan for long term storage of those photos. Saving them to you hard drive is not enough. You need to back them up onto CD’s, DVD’s or an external Drive and even then you should make more than one copy. By the way, make sure you test the backup to make sure the photos are really there. Picture Quality – is in the eyes of the beholder. If you are accustom to taking photos with a high end 35mm SLR, you may not be happy with the photos taken with a consumer level digital camera. But if you have been using a pocket 35mm or disposable film cameras, you will probably be pleasantly surprised. Keep in mind that printing is a big part of the overall image quality. Printing Pictures – Now that you have taken hundreds of digital pictures, what do you do with them? Digital Photo printing has come along way and personal home printers are getting better and cheaper every day. Only a year or two ago, printing 4 x 6 photos at home would cost you about $0.65 each (paper & Ink). Today the price has dropped to about $0.30 a print (not including the initial cost of the printer). The quality of home printers has also improved. You also have many other options such as emailing your digital images out to be printed or going down to your local Walgreens, Walmart or camera store for prints. You can expect to spend about $0.29 per 4 x 6 print with most of these outside sources. Keep in mind that these prices are dropping daily. Don’t just Print Photos – There are so many possibilities with digital photos. I have found that I rarely even print individual 4 x 6 photos anymore, but prefer to create slide shows on CD or DVD with music or narrative. When I do print, I enjoy making large photo collages. After one of my last trips, using a graphics design program, I scanned in the map of the island and placed our photos at the appropriate locations on the map according to where they were taken. Using a large format printer, I printed a 14” x 28” poster and had it framed. There are many programs available for creating slide shows, photo calendars and collages. Be creative and have fun. Size – One of the first things you have to consider is size. Do you want a camera to slip into you purse or pocket or one that requires a camera bag and someone to carry it. Keep in mind that along with smaller size usually comes fewer features, smaller lenses and lower quality photos. Similar to the differences between large and small film cameras. Also remember that even though you may be trading photo quality for camera size. Having a small pocket camera may allow you to capture moments that may not have been possible with a larger camera just due to the convenience factor of the smaller size. Mega pixels – This is basically the total number of dots that are used to make the photo. A 3.0 megapixel camera has roughly 3 million tiny dots. Some professionals claim that good quality 35mm film photo would be somewhat equivalent to a 15 megapixel digital camera, others claim it is more like 8 megapixel. Personally, for the average user printing 4 x 6, 5 x 7 and the occasional 8 x 10 photo, a good 3.0 megapixel camera is fine. I would much rather have 3 million good, clear dots than 8 million fuzzy ones. I may be over simplifying this, but what I am getting at is Megapixel count is not everything. Even though the number of megapixels is just about the only specification you ever hear about, it is by far, not the only thing that dictates the quality of the picture you are going to get. The quality and size of the lens, type of image sensor, auto focusing system, Light metering system, and firmware all contribute to the final image quality. I have one 2.0 megapixel camera that takes far better pictures than some of the 4.0 megapixel cameras I have used. If everything else is equal (2 identical cameras), than the higher megapixal camera is better. But that is never the case. I had one 4.0 camera that took terrible photos, until I downloaded new firmware for it. Yes, the internal software that interprets all that information coming from the sensors, decides what settings to use and then compresses the photo to save it on the memory card can ruin even the best photo. In general, all things being equal, if you plan make large prints or use your photo editing software to crop and zoom into sections of your photo, then more megapixels is what you want. But don’t sacrifice lens quality and other features just to purchase pixels. One thing to keep in mind, watch out for the words “interpolated”, some cameras will use an electronic means of guess at the information between pixels, thus reporting a higher number of megapixels than the actual sensor. You will also see the word “Effective Megapixel” or “Actual Megapixels”. Effective means that the sensor inside the camera has blocked some of the pixels to create the standard photo aspect ratio, so the sensor may be 4.3 megapixel but it is only using 4.0 to create the photo. The effective number is what is actually being used. Lenses and Zoom – There are many types of lens used on digital cameras ranging from the inexpensive, plastic, fix focus lens like those found on many low end cameras (similar to what you would find on a disposable film camera) to high end interchangeable SLR lenses. In general and oversimplifying this, you want to look for the largest auto focusing lens with the most optical zoom. I would go with a minimum of 3x optical zoom. This would be roughly equivalent to 35mm to 105mm for those of you familiar with lenses on film cameras. Many cameras report something like Total Zoom, this is a combination of optical zoom and digital. Don’t pay any attention to digital zoom. Digital zoom is an electronic form of zoom and is really no different than zooming in with your computer after taking the photo. Using it can make you photos fuzzy or grainy looking. Optical Zoom is all you should care about, this is the actual zoom of the lens only. Note: Avoid using digital zoom on the camera. Zoom is as far as you can with optical zoom only. If you need to zoom in closer, you can do that later using your photo editing software on your computer. To lean more about Digital Zoom vs. Optical Zoom, check out http://cameras.about.com/od/cameratips/l/blopticaldigitl.htm . c. Secure Digital (SD) – Most common Now- Most pocket cameras including Canon, Nikon, Casio, Kodak, HP, Pentax, Minolta, Panasonic and most PDA’s, Pocket PC’s and Video Cameras. e. Memory Stick – Primarily Sony Cameras and PDA’s. f. Memory Stick Pro – Newer, Available in larger sizes for Sony Cameras, not usable in older Sony. g. Memory Stick Duo – Newer, small format- not compatible with older products. h. Multimedia Card (MMC) - Not really used anymore in cameras- still in use on some cell phones. i. X digital (xD) – New card for Olympus and Fuji, a little higher cost, small and easy to misplace. Keep in mind that if you already own memory card capable equipment such as a TV, Computer, PDA or a printer, you may want to stay with a camera that uses the same cards. For example: If you own a Sony Television that has a memory stick slot, you may want to purchase a Sony camera so that you can view your photos on the TV without any additional cables or hardware. Simply remove the card from you camera and insert it into the TV. Note: Most all cameras have quality settings that will allow you to reduce the size of the file, thus saving more pictures to the memory card. Experiment with these settings, for many people find that even though they have a 6 megapixel camera, taking pictures at something less than the highest setting is plenty good for their needs and will allow you to take more photos (especially good for travel). a. Lithium Ion Rechargeable – Generally longer life, however you need to have your charger with you and spares or replacements can be costly or hard to find. I recommend having a spare with you. b. AA Size – These do not tend to last as long, but you may have options to purchase rechargeable versions and even one time use Lithiums. It can be more convenient if you travel a lot. With some cameras, you may be able to put in a set of regular Alkaline batteries in an emergency if you can’t get to your charger. Auto and Manual Modes – The better cameras have the ability to take pictures in both full automatic mode (Point and Shoot) as well as Manual Mode. Manual mode allows you to set things like aperture, shutter speed and focus manually to really get the picture you want. Video Mode – You may or may not be interesting in the Video mode that comes with most digital cameras. But if you are planning to use it, check the specs. Some cameras can only take short 15-30 sec videos at low resolution (320x240). Other can take unlimited video up to the size of the memory card at 640x480. I did not think that I was going to use the video mode, but have found it to be a lot of fun. Other – There are many other available features that you may want to consider such as Macro (ability to take very close shots), Panoramic modes, Sound Recording and outputs for TV. But I think you get the idea. I apologize for getting carried away again. I guess the bottom line is to purchase the most megapixel with the maximum optical zoom you can afford. I prefer to stick to name brand companies that are known for making high quality cameras such as Canon, Nikon, Pentax and Minolta and stay clear of no-name brands. Related Sites- If you want you learn more about Digital Cameras or just compare camera specifications, I have found www.dpreview.com to be very helpful and detailed. Concerns about internet security are valid and I am sure this question will draw a lot of response as well as controversy over the exact methods to accomplish your goals. In my opinion, there are several steps as well as general guidelines you should follow to reduce your exposure while surfing the internet. Note: The only way to be 100% Protected is to have no internet at all. Please keep in mind that whole books are written on this subject and I don’t intend to cover the details of each and every aspect, nor step by step instructions. Router - Regardless of who your internet service provider is, your first line of defense is to install a Router between your CABLE or DSL modem and your computer. Some companies now provide a modem with a built-In router, so check your manual for details. You can purchase a basic router for as little as $30. Even better, would be what they call a Firewall Router (Router with built-in firewall) which can run $50 or more. Router Settings – Always change the default factory username and password to access your router. Depending on the type of router you have, there could be additional security settings within the router that you may want to change.. Protected Accounts - If you plan to purchase goods and services online, I would recommend setting up a special online account such as PayPal. Using a Single Card - If you prefer to use one of your current credit cards, set aside a single credit card for all online purchases. Don’t use that card for any other transactions except online. It will be a lot easier to spot errors and fraudulent charges if it is not filled with normal everyday charges. Fraud Protection - Use a credit card that comes with some form of fraud or online purchase protection. (check your credit agreement). Low Credit Limit - Select a credit card with a lower credit limit. Having a credit line of only a few thousand dollars opposed to $18,000 can reduce your potential liability. Purchase From Know Companies - I know it is hard to resist, but I would suggest only purchasing from known companies or ones that have been recommended to you. Do not Respond - I would strongly advise against giving credit card information to any unsolicited websites (pop-up ads or email solicitations). Avoid Following Links - If you want to go to Borders to purchase a book, type their web address in directly, instead of following an unknown link contained within an email. It could take you to a fictitious site that looks just like the original. Spelling Errors - When typing in the address to a website, double check your spelling. Some fraudulent websites take advantage of common misspellings and may look just like the real thing. Common Sense - Use your common sense. If it seems to be too good to be true? … Well, you know the rest of the line. Do Not Save your Passwords - I know it is not as convenient and a real pain, but never store or save your usernames and passwords for anything. Always type them in directly each time. This especially goes for any form of online banking. Create More Difficult Passwords - Be more creative with your passwords, avoid using easy to guess things like your name, birthday and child’s name. Use Numeric and Alphanumeric - Passwords are harder to break if they contain both numbers and letters. Don’t use the same Password - Avoid using the same username and password for everything. Mix it up as much as possible. Change your Password – You should change your password as often as is practical. Separate Email Accounts – I always suggest setting up an extra email account for yourself to be used for all online activity. Most internet service providers such as AOL, Comcast, Verizon and MSN allow you several free email addresses. Use one email account for friends, family and business (the emails that you really care about). Use the other account for all other activity such as registering your computer, software registration, subscriptions to forums and online purchases. Each time you submit you email address online, you have the potential of it getting on some spam list. This can help you keep the flood of email somewhat organized and worse case, if it gets completely out of control, you can delete the account and start over without the hassle of changing your main account. Depending on what email program you are using, you can change the way email is handled to reduce the likelihood of contracting a virus. 1. Receiving Attachments - You can change the settings to prevent attachments that may contain viruses from downloading. This can be a problem if you regularly receive attachments because you may not be able to open them. 2. Opening Attachments – The majority of problems come from opening attachments. Do not open any attachments unless you know the sender and even then I would not open them unless you were expecting it. 3. Displaying Email - I would recommend changing the settings to not show you the contents of an email until you double click on them. 4. Downloading Pictures – You can also choose to be prompted before downloading pictures within emails instead of displaying them automatically. 5. Junk Mail – Explore the options for filtering spam so that you can automatically move them to a spam or junk mail folder. If you wish, you can have them deleted, but I prefer to brief through them to check for the few real emails that may be misdirected. Never give out personal information - I would never give my social security number to anyone. The same goes for account numbers and passwords. If someone called you on the phone, would you give them this information? So, why would you give it to someone on the internet? Be very careful of bank inquires – I received an email recently that looked very official. It stated that there had been some unusual activity on my bank account and that I should follow the link and enter my account information to verify. If it were not for the fact that I did not have an account with them, I might have replied and given some stranger all of my personal information. You are going to need some form of security software. There are numerous software packages out there for handling all forms of security from Virus protection to encryption. In most cases, unless you really enjoy diving in and learning all about it, I would recommend installing a single, self contained Internet Security Package that includes at the minimum, virus protection and a Firewall (ie. Norton, Mcafee, CA, AG). You can purchase each product individually and in some cases mix and match products from different companies to achieve the maximum protection, but you always run the risk of problems or conflicts between products. I prefer to make it simple, one product from one manufacturer. You can purchase all kinds of special software to hide your every move, permanently delete files, encrypt your files and even monitor your children. I am not that paranoid, but it is all available. I would recommend installing one of the many programs available to block and/or remove spyware. Fortunately, two of the best ones are available for download for free. Spybot and Adaware. There are also many other good ones out there. Security Settings - You can change your security settings from within Internet Explorer, by clicking on TOOLS-INTERNET OPTIONS. There is both a security tab and a Privacy tab that you can use to customize your settings. Without getting into all the options, I would suggest experimenting with the various levels of protection and then surfing. If you find you are having problems you can readjust the settings. If you normally go to the same few sites you can add them to your trusted Zones. The privacy tab allows you to adjust how your system will handle Cookies. Some sites require you to accept cookies, but it all depends on your individual surfing habits. Again you can add common sites to Trusted Zones to override security problems. Let me start by saying that a complete reformat and reinstallation of your operating system is something that is often required when a computer system has just become too damaged to continue attempting repair. Over time, viruses, spyware, installing and uninstalling programs and errors that compound themselves, can eventually bring even the fastest computer to a grinding halt. Many avid computer users plan a complete restore once a year or two just to keep things running smoothly. Having said this, there are a number of steps that should be taken prior to reformatting as well as things you can do to help speed up the process the next time. First: Keep in mind that reformatting and reinstalling Windows brings your computer back to the first day that you used it. You will lose everything that you installed and saved to your hard drive since that first day. This includes any online updates. It is extremely important that you have backed up all the data that you want to bring back to your computer. Word documents, photographs, music, address books and emails are just a few examples of the things you might want to save. Don’t assume your backups are good. Double check your backups by reading or restoring a few of the files back to your computer and viewing them. Don’t forget to run a complete virus scan on your saved data to prevent bringing back viruses that you may had. Built in Restore – Many newer computers come with a built-in restore process saved to a second partition on the hard drive. This can usually be accesses by pressing a key during the boot process. For Example: Pressing F10 during boot on HP computers will bring you to a restore menu. Check your computers manual or online to see if you have this option. Restore CD’s – Some computers come packaged with a set of Restore or Recovery disks. The first disk is a bootable CD and is inserted into the CD drive during boot-up. Original Windows XP Disk – If you don’t have either of the above, then you will have to use your original Windows XP disk (you will need your Installation Key Code). If your XP CD is an upgrade version, then you will need an old Windows 95, 98, ME disk as well. No CD’s and No Restore Partition – If you have lost your Restore CD’s or never received any and your computer does not have a restore partition, you can usually order a set of Restore CD’s from the manufacturer of your computer for a minimal charge of about $20. Unplug all USB devices like printers, scanners and palm pilots. If you have several internal cards that you added after you purchased the computer, you may need to remove these. Check Manual for proper key to press for restore or it may show up on the opening screen. Check Device Manager for any Yellow Exclamation Points indicating missing drivers or errors. Click START-CONTROL PANEL-SYSTEM-HARDWARE-DEVICE MANAGER. (Select Classic View) If you have any Yellow Exclamation Points, you will probably need to install drivers for these devices from your CD for that piece of hardware. At this point you have a fairly clean installation and it is time to Update windows. Download and install all Windows updates, especially Service Pack 2 (if not already at SP2). Install and setup any additional external hardware like printers, scanners, Palm pilots, etc. Install each one at a time and reboot and test before installing the next item. Install additional software that you have on CD like Office, Quicken and Photoshop, except Antivirus software. Again install one at a time, reboot and test before going on to the next. With Antivirus software up and running and updated online with the latest virus definitions installed, you can now go online and look for updates for other software or download programs that you want to reinstall. Using whatever method you used to backup your data, you can now restore your data back to your computer. Don’t do this until you have antivirus software running. You don’t want to bring back viruses that may have caused your original problems. You can now go in and tweak your settings to what ever you like, add screen savers and set things up the way you want. Now that everything is up and running just the way you like it, it is time to backup your settings. I prefer to use something like Norton Ghost to make a disk image of this state. If you want to reformat and restore your computer again in the future, you can restore it back to this point instead of all the way back to the beginning, saving a huge amount of time. You could also use Windows XP Pro Backup to make a recovery set. I also recommend using Windows Restore to save a Restore Point at this point. Some people like to set a restore point after each of the steps above in the event that something goes wrong along the way. Unplug all USB devices like printers, scanners and palm pilots. If you have several internal cards that you added after you purchased the computer, you may need to remove these as well. Setting up a Wireless network can be a relatively simple task if all goes well. Just to give you an idea, I have on many occasions, been able to setup a complete Wireless Network, similar to the one you described, in under an hour. Having said that, I have also had similar jobs that can take days to work out the kinks. All you have to do is visit a few networking forums to get a taste of all the potential problems you can run into. If all the computers are in good working order, no viruses and minimal problems, it should go fairly well. If you have a computer that is already giving you problems, watch out. I will explain later… Even though you asked specifically about ADSL, cable is just about the same, so I will discuss it as well. When installed properly, a wireless network is terrific alternative to having to run wires throughout your home or office. Today’s wireless routers and access points are more reliable, faster, easier to setup and lower cost than ever before. They still do not perform as well as a wired network when it comes to data transfer, but for most applications, they are plenty fast. I ran some tests a few months ago just to compare the time it took to move a 28 meg file from one computer in my house to another using some of the different standards versus using a wired network. If you are just accessing the internet, these numbers may not affect you, but if you are moving or backing up large files across your network, streaming video or music from one computer to another, it can make a big difference. Keep in mind that this is not a scientific study and results can and will vary depending on the distance between computer and router, the computer and router settings, the number of computers on the wireless network, manufacturer of the equipment and what type of antivirus software you are running. Note: The laptop to run this test was 15 feet and through one floor away from the Wireless Router and indicated that it was receiving and excellent signal. There are several wireless standards to choose from for use in the consumer market as well as a few proprietary versions of those standards. Without getting into all the details, which I don’t even know, I will try to break it down into 4 main categories and discuss the pros and cons of each. Please keep in mind that much of this is based on my own tests and experience and that every installation is different. 1. Wireless 802.11b – This standard operates at 2.4ghz and has a maximum data rate of 11mbs. This is the most commonly used standard, but will be overtaken by 802.11G very soon. They can be purchased for very little money now, but unless you need are small and your computers are close together, I would pay the extra for G.
2. Wireless 802.11a – This standard operates at 5.8ghz and has a maximum data rate of 54mbs. This standard is not compatible with any of the others. You can find it used in some business applications or where someone is have a lot of interference problems with other devices running at 2.4ghz. I would not recommend using this standard. There are also a few 802.11a,b,g units out there that will work on all three of these standards. 3. Wireless 802.11g – This standard operates at 2.4ghz and has a maximum data rate of 54mbs. This is fast becoming the most popular standard and is compatible with older 802.11b systems as well. There are also some proprietary G units that have increased speed such as Speed Boost or Super G. These units are compatible with other b and g models as well but will only give you the speed increase when used with like cards from the same manufacturer. 4. Wireless 802.11n – This standard has not been approved yet, but there are units out there called Pre-N and Mimo. They operate at 2.4ghz and have a maximum data rate of up to 300mbs. This standard will probably take over the market due to it’s increase in speed and range. I have installed several Pre-N systems and I have found that the range at least doubled if not tripled and is very fast. The Pre-N units are also backward compatible with both 802.11b and g but you will not realize the full potential of this standard without using the matching cards. However, you will experience an improvement in range even when used with pre-existing B and G cards. · Interference from cordless phones operating on the same 2.4ghz frequency. · Interference from wireless speaker systems, baby monitors, wireless video cameras and security systems. · The exact placement of the router and receiving computer. · Other wireless networks in the building or neighborhood. · Construction materials used in the walls or floors (metal studs, foil backed insulation, wire mesh). · Large metal objects such as refrigerators in the room or in direct path of the signal. · The type and amount of furniture in the house. · Even the number of people in the room can alter reception. Security Concerns – You may hear a lot about security concerns associated with wireless networks. I don’t know about you, but my computer does not contain the security codes to the pentagon and I don’t store any of my passwords or account numbers on my computer. So if someone wants to steal this document, go for it… On the other hand, you should know that setting up a wireless network using the factory default setting has no security at all. Anyone driving by your house can access your internet connection. You will need to change some of the settings on your router to enable security features. I will get into some of the basics of this later on in this document (see Security Settings). Too Slow – All of the wireless standards above are typically faster that most of the available DSL and Cable connections available to home users today. So under normal internet usage and reading email, speed is not usually an issue for a few computers on the network. However if you have many wireless computers on the same network and some are performing other tasks over the network or you plan to move a lot of large files over the network, you will want to take this into consideration when designing your network. One computer hardwired – It is desirable to have at least one of your computers hardwired to the network to simplify setup and future troubleshooting. It is not necessary to keep it wired, but will make troubleshooting and setup much easier. You can make it wireless later if you want. If you are planning to use one computer as a server or central storage place for data and even a print server, you may want to keep this one hard wired to the network. It is still desirable to have as many computers hardwired as is conveniently possible and leave the rest for wireless. Location of Hardware – Placement of your wireless router/access point is critical for optimum performance. Placing it in a central location equal distance from all the receiving computers is desirable. Also, installing it above the receiving computers is generally better than below. In other words, placing the router/access point in the attic is usually better than in the basement. Installing it in the far corner of the basement and expecting to get reception on the 3rd floor at the opposite end of the house is unlikely. Avoid other objects – Place the router/access point away from other items in the room such as computers, wires and large objects. Move it to a location high up on a shelf away from your computer, monitor and printer. Experiment First – If you have a laptop with wireless capability, you can use it to test your layout prior to finalizing your plans. You will need a Wireless Router or Access Point, but you do not need to connect the router to your DSL or Cable modem to run some placement tests. First hardwire your wireless router/access point to one of your computers and go into setup (check your manual) and change the SSID (this is the routers name as it will seen by other computers) to anything other than the default. If you leave the default setting for the SSID, which is usually the name of the manufacturer (linksys, D-Link, Netgear), you might pick up someone else’s signal with out knowing it. I ran into this just the other day. A new client called asking me to fix a problem they had been having for over a year, printing to a network printer in another room in the house. When I checked the computer in question, I found that it was not even on their own network. It had been receiving a wireless connection from the neighbor’s house next door for over a year. They were unaware of this because both houses had the same default SSID and this computer was out of range of there own network. 2. Now disconnect the Router/Access Point from the computer you used to set the SSID and move it to the location that you plan to test. Simply plug in the power to the router and walk around your house with the laptop. Go to each location of interest and check the signal strength. Each wireless card has some form of utility to view the status of your connection or you can just use the Windows indicator. In some cases they will even give you a nice bar graph (check your manual). There are several programs that you can download like netstumbler that can help survey your location. You can experiment with different locations for both your router/access point and your receiving computers. Keep in mind that sometimes simply moving the router a only a few inches away from an object can make a big difference. The following is a simplified diagram of a typical network setup with all the components you will need. Figures 1,2,3,and 4 all basically accomplish the same thing. Where Figure 1 shows all of the individual components and Figure 4 is a single box containing everything on one unit. You can either purchase all the components separately or purchase combo units that contain multiple components within a single box. The idea is similar to a stereo system. You can purchase a tuner, amplifier, CD player separately or purchase a complete Receiver with everything built-in. I usually recommend purchasing all of the components from the same manufacturer. Even though most all brands are designed to work together, it may result in lower performance if you mix brands. Also, it will be a lot easier when it comes to technical support to be calling just one manufacturer for help. The same goes for mixing wireless standards, you could purchase an 802.11g router and a mix of 802.11b and 802.11g cards. It will work, but with reduced performance. Cable or ADSL Modem – Broadband providers usually offer the modem for free or for rent. In the case of ADSL, the modem is usually provided for you. For cable modems the rental fee is usually a few dollars per month or you can chose to provide your own. If your provider is charging a dollar or two per month for the rental, I would go with that. If they are charging more, you may want to consider purchasing your own. Based on my experience so far, I have found that it is not uncommon for the modem to start exhibiting problems after about 2-3 years. Lightning strikes and power surges could be a contributing factor to these early failures. If you purchase a modem for $60 or rent for 3 years at $2 per month, it is about a wash. But that is your choice and may be completely different in Malaysia. Cable/DSL Wireless Router or Access Point – You will need a Router and a Wireless Access Point or the more common Wireless Router (which contains both a router and an access point in one unit). Note: A few companies make a combination Modem, Router, Access Point and Switch all in one unit. You should also check the modem that may have come with your internet service, because some providers are starting to supply Modem/routers units. One other thing you need to check is that some providers have been known to supply a modem with only a USB connection and this can not be used for setting up this kind of network. Normally I would just go with wireless router, unless you have a situation where you need to place the access point in a different location than the router for better coverage or if you already own a router. Wireless Cards for Each Computer – You will need a Wireless Card for each computer that you plan to use wirelessly. Laptops – Depending on how old your laptops are, some of these my have wireless built-in. If not, you can purchase Wireless PCMCIA Cards for each. Desktops – You can purchase either Wireless PCI cards that are installed into an available PCI slot inside the computer or an external USB Wireless Adapters. I would recommend the internal cards, especially if you already have several other devices connected through USB, such as Printers, Keyboards, Mice and WebCams. Surge Protectors or UPS – I would make sure that the modem and router are both plugged into some form of surge protector. Better still would be to use a UPS (Uninterruptible Power Supply). These units have a built-in battery to power your equipment in the event that the power goes out. I have seen some of the smaller units going for as little as $30. Check Computer Name and Workgroup – Right Click on MY COMPUTER- Left Click PROPERTIES – Left Click COMPUTER NAME to check the Full Computer Name and Workgroup Name. You want to make sure each computer has a different full computer name and at the same time each computer is using the same workgroup name. Turn off Firewalls – For the initial setup, it is usually easier to turn off or disable all software firewalls. You have one built into Windows, but you may also have others installed that may be included with Norton or McAfee internet security packages. Shared Folder and Printers – If you are going to share files and/or printers with other computers on your network, you can select these now. Sharing Printers – Select START – CONTROL PANEL – PRINTERS AND FAXES, Right Click on the printer to be shared and select the SHARING tab. Click the SHARE THIS PRINTER box. The Share Name box will now contain a default name for the printer. You can leave the default name or change it to whatever you want (keep the name to 8 characters). If your network has computers running anything other than Windows XP, you will need to add print drivers for the other versions of Windows (ADDITIONAL DRIVERS). Otherwise, click OK to exit. You should now see a hand under the printer icon, indicating that it is being shared. Perform the same steps above for any additional printers you want to share. Verify Broadband Connection – The first thing you want to do is connect a single computer directly to your cable modem or DSL modem. Run the setup disk that was given to you by your provider and check to make sure everything is working correctly. If your modem was already connected and running, you can skip this step. But if this is a new installation or you have moved your modem to a different location, test it with a single computer first before attempting to network. Setting up the Router and First Computer – Now that you have determined that your internet connection and modem is in good working order, you can move onto setting up the router and first computer. Connect the Router to the modem and then plug your first computer into the router. Run the setup disk that came with you router to get the first computer up and running. You can run the Windows XP network wizard which will prompt you to create a setup disk for the remaining computers or choose to do everything manually. Note: I would recommend not applying any security until you have all the computers up and running on the network. I would change the default SSID, so that you will recognize your network later. Setting up the Remaining Wired Computers – You can now proceed onto setting up each of the remaining computers. With the power off, plug in each additional wired computer and power on. Run the Windows Network Wizard or use the disk you created from before. If you plan to share any folders or printers, you can set those up as you go for each computer. Setting up the Wireless Computers – If your laptops came with built-in wireless networking, you may need to first turn the wireless receiver on (Most laptops default setting is off to save power, see instructions for laptop). You should see a popup that indicates that the laptop has found a wireless connection. Click on this to see a listing of the available connections. If there are other wireless networks in your area you will see them listed. Scroll down until you see your network (whatever name you used for SSID), then click on that and connect. It will ask you if you are sure you want to connect to this unsecured network. Go ahead and connect. If you are installing wireless cards, follow the instructions that came with the card to install the drivers and then follow the instructions above. You should have your network up and running now without any security or firewalls running. So it is time to start setting up your security. Keep in mind that the factory defaults for wireless has Zero security. Personally, I am not a fanatic about security and I don’t have anything that anyone would want, so I try not to get too carried away. But if it is a real concern, there are a number of security measures you can take depending on the type of hardware and software you have. Most Wireless Routers and Access Points have several setting you can adjust to add security to your network. I would recommend changing only one or two settings at a time and then testing your network before continuing. Change all Default Passwords – The first thing to do is change all the default passwords for your router or access point. The default passwords are common knowledge to most anyone. Change the SSID – I would change the SSID (network Name) as mentioned above, as well as you may want to turn off the broadcasting of the SSID. With broadcasting turned off, someone would have to know your network name before attempting to hack. Enable WEP – Depending on your router you may have the option to enable 64 bit or 128 bit encryption. If this is enabled you will need to create a code and then write it down to apply it to each wireless computer that is going to be on the network. Someone would have to guess or try every possible combination to gain access. WPA – The newer Wireless equipment may also offer this form of security which is considered to be far more secure. If your router offers WPA then I would use it instead of WEP. MAC Filtering – You can also select Mac filtering to allow only those computers that have a specific Mac Address to access your network. The Mac address is somewhat like a serial number for your computer. Someone could still access your network if they knew this address. Firewalls - After you have applied all of the security settings you want, you should now go back to each computer and turn on any firewalls that you may have. This would include the Windows Firewall or any third party firewall software. You will have to go into the firewall settings for each computer and enable print and files sharing (if needed), and you may have to enable network activity by entering in the IP address range of you network computers. For more information regarding Wireless Networking check out the section on Poor Wireless Range.